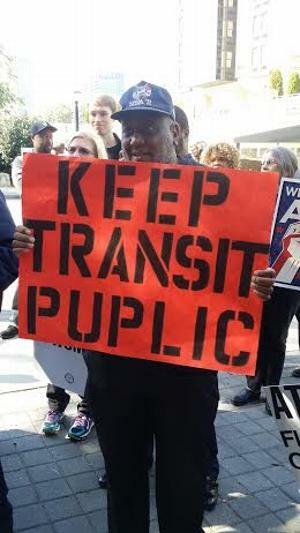 (APN) ATLANTA — On Thursday, November 06, 2014, the Board of Directors of the Metropolitan Atlanta Regional Transit Authority is likely to greenlight a bidding process for private contractors to take over MARTA Mobility, the paratransit service for elders and people with disabilities. The Amalgamated Transit Union, representing well over half of MARTA’s full-time workers, has escalated efforts to prevent the privatization of MARTA Mobility, saying that it would hurt riders and workers alike. This is not the first time the privatization of MARTA jobs has been on the table. MARTA Mobility was outsourced to Dave Transportation for a number of years, until MARTA ended the contract in 1997 due to the company’s poor performance. Last year, a bill introduced in the State House by Rep. Mike Jacobs (R-Brookhaven) would have forced MARTA to outsource numerous operations, including paratransit services. Jacobs also sought to restructure MARTA governance, switch from offering pensions to 401(k)s, and change employee arbitration rules. Jacobs, Parker, and the Board have based these moves on recommendations put forth in a report that MARTA commissioned from the international consulting firm, KPMG, in 2011. KPMG recommended MARTA deal with the projected budget shortfall with more cuts. The report advised outsourcing as a cost-cutting measure in several areas, including paratransit, cleaning services, call center services, and payroll. KPMG came to the conclusion that these cuts were necessary by comparing MARTA to five “peer” transit organizations and finding that MARTA’s spending topped their average by $50 million annually. Sclar points out that MARTA’s biggest challenge is a lack of state and local funding. One such study, sponsored by the Federal Transit Administration in 2010, relied on an oversight committee that included none other than MARTA CEO Keith Parker, then-President of San Antonio’s transit agency. That study found that privately contracted paratransit services often had higher turnover rates than public entities that operated “in-house” paratransit services. The study went further to say that high turnover typically resulted in an inexperienced and understaffed workforce, unable to deliver the quality services necessary to meet the diverse needs of paratransit riders. High turnover not only disadvantages riders, the study contended, but also racks up higher training costs as new employees constantly cycle through. As to the cause of high turnover rates, the FTA-sponsored study pegged low wages and paltry benefits as the main reasons that contracted paratransit workers left the job. “Investing… in improved recruitment, training, compensation, performance bonuses, and better tools and support to achieve lower turnover would therefore make sense,” the San Antonio report said, a far cry from the recommendations made by KPMG and pursued by Parker and MARTA’s Board. “It’s about the relationship that you build with a community. When you drive somebody everyday back and forth to their dialysis, or you ride somebody every day back and forth to the grocery store, and you see that little smile on their face and you know that you made a difference, you begin to care about people. In the private sector there’s a high turnover and you can’t build those relationships,” Curtis Howard, President of Amalgamated Transit Union Local 732, said. Howard and the union members he represents are doing everything they can to sway the Board’s impending decision on whether to open the floor for contractors to bid on MARTA Mobility. They’ve tried to meet with Board members, though Howard says only some have been willing. They rallied alongside locked-out Atlanta Symphony Orchestra musicians and over 100 supporters at the Arts Center MARTA Station earlier this month. Union members also held a vigil outside the home of Board Chairman Robert Ashe, son of former State Rep. Kathy Ashe (D-Atlanta). For their activism, they’ve experienced backlash. Union representatives attempting to share information with MARTA workers at a bus garage were confronted by MARTA police three times in one week. The officers threatened them with arrest for criminal trespassing. During the third incident, thirteen police officers were called to the scene. Howard says he placed a call to Parker, and that Parker told him the literature they were distributing was the issue. Parker denies having any involvement in the actions of MARTA police. “I had no role [in the police response] whatsoever and I do not direct actions of the MARTA Police Department,” Parker said, in an email to Atlanta Progressive News sent by MARTA spokesperson Lyle Harris. Harris is a former reporter for the Atlanta Journal-Constitution and an affiliate of the pro-privatization public relations firm Alisias. “Our General Manager had absolutely no role whatsoever in this incident and he does not direct the actions of the MARTA Police Department. Any claims to the contrary about his involvement are flat out lies,” Harris said in a follow-up email. Howard said that in his two decades as a union steward, he has never seen police try to move union organizers off their turf. But he isn’t fazed. “We’ve got workers now who are living in poverty and already on government assistance while they’re working a full-time job, and that’s a disgrace to this City and this country,” he said. CORRECTION: A previous version of this article reported that Robert Ashe is the husband of former State Rep. Kathy Ashe. In fact, Robert is the son of former Rep. Ashe.